Thanks to its small size, the LANCHI MONSTER drone is suitable for both indoor and outdoor flights. 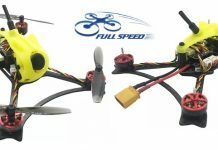 Anyway, due to the powerful brushless motors I recommend this mini FPV racer for indoor practice only for experienced pilots. Like many recent racing drones, the LANCHI MONSTER is also based on the versatile F4 flight controller. 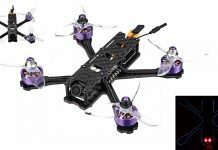 By default it comes with the popular BetaFlight software. On top of the 76mm sized carbon fiber frame is located a 700TVL camera with integrated 40CH, 25mW VTX. According to your existing radio transmitter, you can opt between: FrSky RX, FlySky RX or no radio receiver.